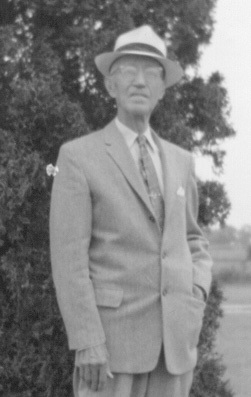 Albright, often called "Bright," was born June 3, 1881, in Hancock Co., Ohio. 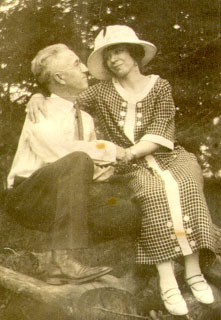 He was married to Carrie Alice Todd on Nov. 2, 1904, in Bluffton, Allen Co., Ohio, by Rev. 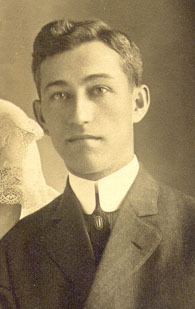 John Todd, her father. Carrie died in 1943, and a year later Albright married Alberta Smith DeBow. Albright was employed as a salesman and buyer for Gregg's Department Store in Lima, Ohio. His obituary says he ran a grocery store in Dola, Ohio from 1947 until his retirement. He also wrote poetry, and is remembered by his family as being funny and sentimental. He was clever at making a home more efficient and attractive, and did painting and carpentry. Albright composed many poems during his life, taking inspiration from the world and situations around him. Some were for Christmas or birthday greetings, many were about his family and family life. A few of his poems follow. And it rhymes with Howdy Doody. And was called "Bright" by every voice. And I accepted, t'was the thing to do. When we'd meet would say, "Hi! Shiffy!" And said, From now on you'll be known as 'Al.'" But I know many old friends still think I'm "Bright". And justly so t'was said. And a Tam-o-shanter on her head. And many dates could have had. Who was OKed by her dad. "Why, of course, sure thing." The time soon came for wedding bells. The marriage day was set. For two and maybe more, you bet. The finest in the land. In answer to their demands. In other homes to live. Ever ready to take and give. Then I'll know I'm growing old. Then I'll know I'm getting old.